Combat Geometry: I’d heard that language used quite a bit but it always seemed somewhat abstract to me. When I arrived at my first Semangat Baru silat class with my roll of blue painter’s tape it was very clear that geometry was the law in that space. We measured out strides 2.5 foot lengths, worked tirelessly off the langka (tiga, sliwa, etc. ), and methodically investigated balance, angle, body position and timing. 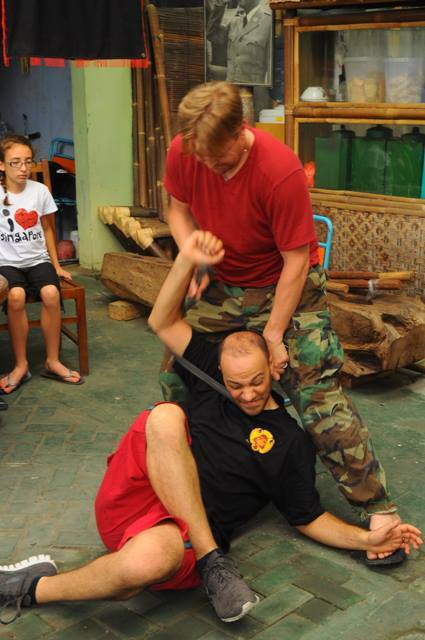 I’ve enjoyed this style of penjak silat because of its emphasis on close quarter fighting. I’ve continued in this practice because of this both practical and academic attention to detail and the way it has informed much of my teaching pedagogy. We’re back! BLACK BOX FS spring session is coming! This quarter our focus is GRAPPLING: Take downs & maintaining top position. 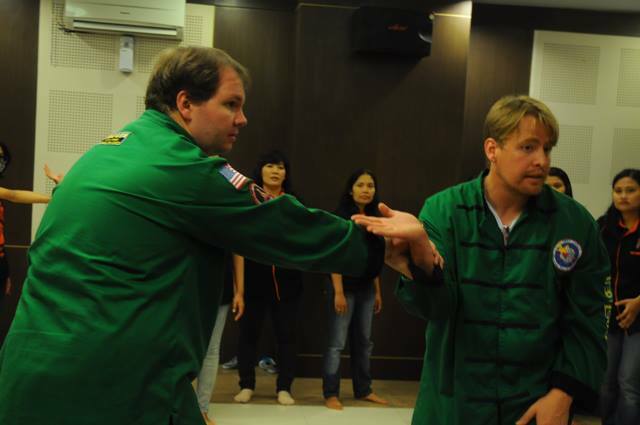 BLACK BOX is the MSMB lab for developing well-rounded cqc skills and testing them in application. Beginning March 21st… Get in touch for more info contact@msmbnyc.com *As always, free for our MSMB comprehensive members. It’s been such an honor to have Guru Robert as a teacher, facilitating my silat journey. His patience, humility and deep understanding have been as engaging as his skill and I figured it’d be a pleasure to get his take on just 5 Questions about his ideas on teaching his student journey. Robert Hilliard of Kuno Silat talks back to 5 Questions from Njoli Brown at NoPaper. I’ve been around martial artists my entire life. I had two brothers that studied Okinawan karate. They where basically my first teachers. When they would see me and my friends imitating martial arts moves, they would came and make corrections. Occasionally they would let us spar with them. This would typically end with me and my friends on our backs, or a bit bruised up. The younger of my two brothers, who was ac tually a black belt, had a friend who was opening a Kung-Fu school in a local community center. My brother thought that would be good training for me, so he enrolled me and another of my siblings at the school. I trained there until I finished high school. After college, I ran into a friend that was studying Wing Chun. I loved the efficiency of that system and trained for over ten years. After that, I was introduced to silat by a neighborhood friend. I was instantly drawn to it’s effectiveness and completeness. My experiences have been varied. I try hard not to look at them through the lens of good or bad, but as learning opportunities. I’ve had some teachers that were, what some would consider heavy handed, while others were nurturing and accommodated. Early on, some of my teachers pushed so hard that I got injured during training. When this happened, they would frankly state that it was not the training methods that caused the injuring, but my lack of conditioning, etc. Those were unpleasant experiences, but they taught me to listen to my body. It also taught me that good teachers don’t push their students beyond their physical limitations. I should note that those experiences happened while I was studying others systems. The vast majority of my experience with silat have been incredibly positive. As an instructor, I try to create a warm and welcoming environment where people can come to class, work hard, and enjoying their progress. I teach my students that success in martial arts, or life for that matter, is not a straight line. It’s okay to struggle and fail as long as you are “failing forward.” As far as my student’s aspirations go, I want everyone to be ambassadors of the art and have confidence in their ability to execute what they’ve learned with confidence in class or in the street, if need be. I manage my personal practice by making sure that I carve out time during the day to train all aspects of the art. I learned that it’s easier for me to train early in the morning (around 5:00 am). Of course, you can’t train everything in the system in one day, so I focus on certain aspects throughout the week. The jurus (forms), I train everyday. I also try to make sure that my general fitness is good. I’ve also learned to listen to my body, so I don’t train when I’m sick or injured. Instead, I give my body time to heal. To make things relevant in my daily life, I use the two basic principles of silat: adat and hormat. Adat is how you conduct yourself. Hormat is respect for all around you. As a instructor, I believe that I should be a mirror for my students outside of class as well as inside. Robert Hilliard is a student of Senior Guru Tim Anderson and a long time promoter of this Indo-Dutch system of silat as Head Instructor of Kuno NYC. He additionally has an extensive background in Wing Chun. Robert brings his classes alive by consistently imbuing them with a community feel while committing his students to a highly technical and detail oriented practice. Semangat Baru is the name of our specific style of Pukulan Pentjak Silat. It translates to “New Spirit” and reflects our new way of viewing and teaching the ancient art of Silat. We operate free from any kind of “secrets” or “martial politics” that can become attached to coveted knowledge. The style itself focuses overwhelming an opponent with strikes, while finding leverage points to take their balance and ultimately subdue them. Silat is a collective word used to describe martial arts originating from South East Asia, such as Malaysia and in our case Indonesia. Pukulan is a word that means striking. In this case denoting a silat system that places a heavy emphasis on hitting. Pentjak is generally considered to refer to the movements and performance of forms where “Silat” is an expression of those motions for use in combat. So “Pukulan Pentjak Silat” could be seen to mean something like “Striking form based Indonesian Martial Art”. *Special “thank you” to Jelena Antanasijevic for the photos. Every summer I spend about a month and a half out in the Northwest. I’m getting my hiking in, connecting with family and friends, yeah, hard life. But I also consider this the time where I earn my keep. I hit my boxing training a bit harder, I work my silat, try to make the rodas and capoeira classes I can and I double up my gym time when I’m not in the mountains. Back in NYC I have a fantastic group of students and colleagues who’ve been generous over the past few years to work with me as I develop and to dedicate their time to learning what I have to teach. Now, I’m lucky in having some fantastic teachers who’ve spent years giving me the tools and the kind of support it takes to let me feel confident imparting their gifts. But all this being said, the worst thing an instructor can possibly do, is rest on his/her laurels. How many of us have seen the result? Too many. Now this is obviously taking into account those with debilitating injuries, mental or physical conditions (ie age, disease), etc. Even so, I recall an event where my capoeira teacher taught his workshop from crutches. I also know a student who spent her year of physical recovery translating articles and interviews of old mestres from Portuguese to English. I figure, the least I can do is model the kind of consistent growth I ask of my students. So, what does that look like. No, it doesn’t have to mean an extra 4 days a week at the gym or a complete overhaul of your training regimen. But what it does mean, is taking a good look at the holes in your game and exhibiting the kind of diligence it means to clean them up. Conditioning slipping? Perhaps show up that 20 minutes before class to jump rope (low impact on the knees and high return on the effort). Be okay with showing your students what it looks like to work before you work. Feel like you’re losing those fast hand mechanics? Get yourself to a boxing gym and ask folks who know the science to help you clean up your technique. Speed is as much muscle elasticity as it is strength. When was the last yoga class you hit. Local community center… free. Maybe I’m hurt and out to the physical game for a while but am I innovating in ways to train my mind?And maybe, just maybe, you need a reminder of what it’s like to not be good at something. Push yourself, find the time and earn your keep. *Thoughts? Suggestions? Definitely kick them down. It is truly a pleasure to be able to include Damon in this edition of NoPaper. He has a been a mentor to me in many ways without even realizing it and has wonderful insights to share which can be applied to all of our artistic and cultural practices. I first encountered the Southeast Asian martial arts between my Freshman and Sophomore years of college. I was home for the summer when a friend of mine was telling me all about this “Kali” art that he was studying. At the time, I had never even heard the term Kali or Arnis / Escrima for that matter. In any case, I had been interested in martial arts for as long as I could remember and had practiced a couple of different arts by this time. Like most American kids in my generation, inspired by Ralph Macchio I studied at a “Karate” school which was really Tae Kwon Do. Later I ended up taking some Hapkido. But I was certainly interested in something more. Anyway, through this friend I was introduced to an Indonesian martial artist named Paul Prijatna. His primary art was Kali, but growing up he had learned Pencak Silat from his uncle. I was impressed by Paul. He was very unlike the Westernized artists I had met so far and he embodied more of the internal and spiritual aspects of the art that I was looking for. We had many conversations about energy (i.e. chi), meditation, and the proper conduct for a martial artist. There was no ego or machismo that I’ve later come to associate with sport fighting etc. Paul only charged me $50 for several weeks of training and at our last meeting before I returned to school he pulled out my check and ripped it up. “I just wanted to make sure you were serious”, he said as he handed me the pieces of ripped paper. While my training with Paul was very short, he put me on the path towards FMA and Silat that I still follow today. One thing that I believe to be a personal weakness is not knowing enough about the customs and cultural heritage of the styles that I study. I am not particularly well-versed in the language and histories of the Philippines and Indonesia, for example. However, I have visited both countries to study and learn. And although I have perhaps fallen short in some areas, I have tried to make a sincere effort to know about my teachers, their philosophies, why they move the way that they move, and especially their perspectives on the spiritual aspects of the arts. of the art that it really remains alive. And of course, the manner in which the art is transmitted is crucial here as well. It is my ambition, therefore, to be both a reflection of my teachers and an individualized expression. At the end of the day, none of us are a source of anything… we are merely channels of that thing. Training builds that channel within the student, and each student is different. Lately, with respect to Pencak Silat and FMA, I’ve been contemplating a metaphor of a squirrel trying to climb two trees. It is, of course, impossible to climb both at the same time. In the beginning of our practice we tend to see each trunk independently as well as its differences from the other. And yet at the level of the branches, the trees come together and the practitioner can seamlessly traverse between them. So it becomes a question of how far apart are the trees and how great is their breadth in the understanding of the practitioner. My personal experience in the way that I’ve learned them, Pencak Silat and Arnis/Kali/Escrima are kind of like complimentary opposites. The movements and the core physical training, to me, do not seem to conflict. Likewise, many of the principles are common between them. Hence, I would say that these two trees are close together. However, there can be considerable variation in how the information is conceptualized by the teacher and imparted to the student. This can be true even amongst teachers within a single system. And I have found that when observing the gross movements between different styles, for example, while they may appear to be very similar, when actualizing the movement with the intent and mindset of the respective style they are very different. Hence, for me it has become less of a matter of “how does art A perform movement XYZ?” and more about “how do I move with this art?” I will say that each art has given me an augmented view of the other as I can take a somewhat out-of-the-box perspective by analyzing a technique etc from the vantage point of another style. I am sure this must be true of anyone who has learned more than one art. However, we must be cautious. It is one thing to be able to shift perspectives and it is another to try and interpret one art through the lens of another. I’ve seen many students who have slowed their progress through this fallacy. You’ll often hear people say things like “Oh yes, we have that in JKD too.” or “In my art we would do it like this.” As an example, 4 years ago I began learning Kalis Ilustrisimo under Kuya Raul Marquez. At that time, I was already a Lakan and senior student in two other styles of FMA (Kombatan Arnis and Kuntaw Kali Kruzada). And yet, in my first lesson I had to come to terms with the fact that I really didn’t know anything. Raul’s teaching method was completely unlike anything I had experienced. Nothing was broken down into simple steps. There was no rote memorization but rather it was fistfuls of information that I had no hope to process… I just had to swallow as much as I could and try to keep up. The movements appeared familiar, and yet I couldn’t apply them in context. My timing was off, my footwork was backwards, and all of my instincts seemed wrong. After each lesson, I’d ride the subway for an hour from Queens back to Brooklyn and my head would literally ache. If you were to ask me, “what did you learn today?” I wouldn’t even be able to tell you and yet I could see myself improving. Hence, I was faced with a choice… I could accept returning to the status of a “beginner” or I could let my ego get the better of me. Fortunately I chose the former. By putting aside my pride and approaching the lessons with the beginner’s mentality, I feel I was not only able to learn the movements much faster, but to understand the underlying principles and philosophy at a deeper level. Ultimately, this experience proved beneficial to my progress in every style that I practice. I think that most arts run much deeper than we tend to recognize. Although it is not always overtly expressed, my teachers all seem to embody this appreciation. Despite their accomplishments and recognition, they are still students of their art. To me, that is one of the greatest lessons I’ve learned from them. If we view ourselves as a rank (black belt, lakan etc), we find ourselves repeatedly disappointed. We can never really live up to our own expectations of what that rank entails. However, when we recognize ourselves as beginners, we can only improve. This disposition has not only helped me progress as an artist, but ultimately has allowed me to reap more enjoyment from the arts. Regarding their differences, perhaps the greatest contrast that I’ve noticed between the style of Silat that I study (Inti Ombak Pencak Silat – IOPS) and the styles of FMA that I practice (Kombatan, Kuntaw Kali Kruzada, and Kalis Ilustrisimo) is that the FMA is very martial focused whereas I would say that IOPS is more holistic. I mean this in the sense that IOPS is not only external (i.e. martial) but also emphasizes internal aspects (breathing / meditation) as well as spiritual. Case in point, the Lakutama organization, of which IOPS is a part, has branches dedicated entirely to spiritual and healing practices. I believe that these aspects are still embedded within the FMA, but perhaps due to colonialism are more buried under the surface. You don’t regularly come across FMA practitioners with a heavy emphasis on internal training, for example, unless they have learned other arts. Of course, that is a generalization. For instance, I know practitioners from Mindanao who are very spiritual and have a very holistic approach to their art. But generally speaking, as it is practiced I feel that IOPS has a more overt emphasis on the entirety of the person going beyond physical and martial applications. I’ve seen IOPS have a profound and lasting positive impact on more people (not only students) than any other art that I’ve encountered. Ironically, while I regret to have had less opportunity to study directly under Guru Daniel Prasetya as I have with my other teachers, I would say that he has had a greater influence over me at a personal level (beyond martial) than almost anyone I’ve ever known. I think that it is unfortunate that more arts don’t incorporate these aspects. A personal challenge for me has been in the realization that life’s time constraints do not allow me to practice nearly as much as I feel like I should. This is exasperated when learning more than one style. And the ego can become particularly threatened when seeing oneself surpassed by your peers. Time spent “advancing” in one art is time sacrificed in another. But as I’ve matured as an artist, I’ve come to worry less and less about the recognition of certificates, rank, title, or the successes of my peers. I only strive to be a better artist today than I was yesterday. And when we are at the level of the tree’s branches, it is not about how many drills we know etc… simply, how well can we connect to the roots of the tree? Is the root of the style inside of you? In the years that I’ve been studying Arnis, there has definitely been an upsurge in the popularity of the Filipino Arts. Several action movies have begun using FMA inspired choreography, new schools and styles are popping up everywhere, and there is a ton of videos, Facebook groups, websites, and equipment suppliers that have popped up. In general, I see this as a positive change but it certainly has its drawbacks as well. For instance, I’m happy to see people from all over the world making pilgrimages to the Philippines to pay homage and learn from the originators of the arts. Likewise, with how much Western culture tends to be idolized and idealized in parts of Asia, I think that for Filipinos to see Westerners visiting their homeland to learn their native arts hopefully gives a sense of cultural pride. It is a shame to think about how many Filipinos (and Indonesians) forego their native arts to pursue TKD or Karate etc due to either a lack of awareness or lack of respect for their indigenous art. On the other hand, the manner in which FMA tends to be embodied in the US is often less than optimal. There is a lot of ego and insecurity wrapped up in the arts and veiled behind catch phrases like “combat effective” or “battle tested”. Not to say that the arts are not incredibly effective, because they are. However, many practitioners seem to study the arts more for the protection of the ego than protection of the person. As to the competition between groups and styles, in terms of self-defense, our mindset should not be how does one style defeat another. I’m not training to fight another style. I’m training to defend my person and to defend others. Therefore, to me all of the saber rattling that goes with “style-pride” is wasted breath. It is also easy for us to get caught up in pitfalls involving recognition. This comes in the form of belts, certificates, logos on T-shirts, and even our posed pictures with the masters. The only proof of your practice comes in the expression of your art. Is it part of you? Any other artifice that represents that, to me, is BS. And it upsets me when I see people visit the masters, paying them a trifle then demanding a lesson and a photo opportunity. How many masters die poor while the styles of their own creation thrive abroad? Essentially, the real art is an intangible thing. It lives in us and is ever changing. But that is hard for us to accept and we cling to the token instead. That is also why we are more concerned with the number of techniques we carry in our suitcases rather than how well we understand the principles. I count myself extremely fortunate for the teachers I have had who have instilled this sense into me. I think that the most exciting project for me has been my ongoing involvement with the Kapatiran Mandirigma organization which was set up to be a celebration of Indonesian and Filipino martial arts. We’ve sought to foster a community of sharing amongst styles and artists and have done our best to put a sense of family over politics. This group was created by my teacher, Grandmaster Shelley Millspaugh (Kombatan Arnis), who most certainly has been one of my greatest martial influences. Shelley believes that as artists we have so much to share and learn from one another, and so this organization serves as a vehicle for us to meet other groups, cross-train between styles, and congregate as a family at our annual camp in Estes Park. I have been extremely fortunate to have fallen under so many teachers with this mentality. Prior to the formation of Kapatiran Mandirigma, I moved to NYC and began learning from Datu Richie Acosta (Kuntaw Kali Kruzada). To this day I have yet to meet a practitioner with as much uncanny speed, power, and precision as him. But more importantly, I have yet to meet a more humble person. Soon after beginning my study of Kuntaw Kali, Shelley to visit NYC and teach a seminar. Datu also assisted me in hosting Guru Daniel on more than one occasion. Consequently, Datu became one of the first members we invited to the Kapatiran Mandirigma organization. I mention this merely because it gives me both a sense of pride about FMA and Silat in the US as well as hope for the future when I see so many artists with various backgrounds come together to foster an environment of mutual respect. This posture of openness not only serves to minimize conflict, but gives the students an invaluable opportunity to see their own art from many perspectives and to broaden their horizons. The best teachers are the ones who are forever students. They are the ones who do not view themselves as “the source” of the teaching, but merely a guidepost for the student. And since the inception of Kapatiran Mandirigma, I’ve seen my teachers grow as much as we have as students. And now the responsibility for hosting the 2015 Kapatiran Mandirigma camp has fallen to me and the other senior members of our organization. For me, this is an exciting opportunity to bring all of my teachers together in one place. We hold our camp annually in Estes Park around late June. The camp is essentially open to anyone, provided they have the right disposition and a willingness to learn. Damon has studied martial arts since childhood but has been learning various styles of Silat and Arnis since 2000. His formal study began in 2002 when he met Grandmaster Shelley Millspaugh in Kansas City, MO. GM Shelley is a direct student of Great Grandmaster Ernesto Presas, the founder of Kombatan Arnis, as well as a student of Kuntaw Silat under Bapak Willem deThouars. Through GM Shelley’s encouragement, Damon has branched out and learned from several other instructors. In 2004 at a seminar in Arkansas, Damon met Guru Daniel Prasetya and shortly after began his study of Inti Ombak Pencak Silat. While he had some previous experience with Kuntaw Silat through GM Shelley, this was his first introduction into a formalized internal practice inclusive of breathing and meditation disciplines. In late 2005, Damon and his family moved to New York City where they lived for 8 years. Soon after he began learning Kuntaw Kali Kruzada from Datu Richie Acosta. At GM Shelley’s request, Damon also sought out Kuya Raul Marquez of Kalis Ilustrisimo and has been a student of KI since 2010. Other notable teachers and influences include Paul Prijatna who first introduced him to Southeast Asian martial arts, Guru Michael Leininger (Init Ombak Pencak Silat) who first introduced him to the internal side of the arts, Mas Sigit (Inti Ombak Pencak Silat) the spiritual leader of IOPS, Master Kurt Graham (Kombatan Arnis), Grandmaster Steve Todd (founder of 5 Way Method), Grandmaster Jeff Sprawls (founder of Maju Bela Diri Pentjak Silat), and Master Style Allah (Combate Eskrima Orehenal) who first introduced Damon to the art of the blade. In 2009, Damon joined the Kapatiran Mandirigma (KM) organization and is currently a senior member & master instructor of KM. He is proud to represent the KM organization which serves to support many artists and teachers from various backgrounds and styles. Damon currently resides in Denver, Colorado.